If your loved one died as a result of another person or entity’s negligence or recklessness, you will likely qualify to seek compensation for your losses via a wrongful death lawsuit. To find out if you have a legitimate claim, contact the Killino Firm today. At the Killino Firm, we know wrongful death. We understand the emotional trauma associated with the death of a loved one, especially if it could have been prevented. 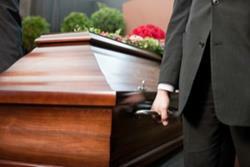 Our injury and wrongful death attorneys have extensive experience in wrongful death claims. In fact, we were nationally recognized for a death case that prompted a national recall of some 450,000 Chinese-made tires and for a wrongful death and survival action involving defective Heparin. At the Killino Firm, we handle every death case with the same intensity as we have the Chinese tire recall and the tainted Heparin matter. We zealously fight for surviving family members of those killed by another’s wrongdoing and make sure they are compensated for their pain and suffering. No matter what the circumstances, a death of a loved one is usually followed by sadness, grief and emotional pain that will never go away. While we recognize that there is nothing that can bring your loved one back or make up for his or her death, we are committed to holding those responsible accountable for their actions. We will fight aggressively to make sure you recover the full amount of compensation you are entitled to. Due to the complexity of wrongful death cases, it is important that you speak with an experienced wrongful death attorney immediately following the death of your loved one. The more time that elapses, the more difficult the case becomes, for many reasons. Evidence may be lost, key witnesses may forget what exactly happened, and your statute of limitations may expire. Choosing the right attorney is an important decision that can make or break the outcome in your case. at the Killino Firm, our personal injury lawyers have extensive experience in handling serious injury and wrongful death cases. We will handle your case with honesty and care so you know what to expect at every stage of the process. To schedule a free and private discussion of your case, contact the Killino Firm today.